Use dowels to connect 1" tiles together. Description - Safe-Play rubber playground tiles are designed to keep children safe. 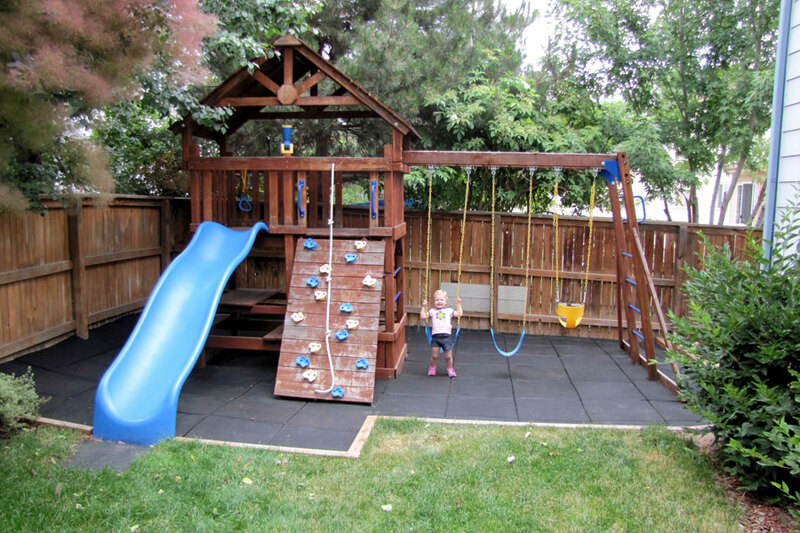 Safe-Play tiles are the perfect surface for jungle gyms, swing sets and other playground equipment. Since safety is the number one priority for playground tiles, Safe-Play rubber tiles are available in many different thicknesses to ensure the safety of children from different possible fall heights. Another feature of the playground tiles are that they are very versatile, they can be used indoors and out. When used outdoors, the tiles provide proper drainage when installed correctly. The rubber tiles are available in an array of different surface colors. ADA approved ramps are also available for children with disabilities. Please contact our customer service professionals for more information on ADA approved ramps and aprons. 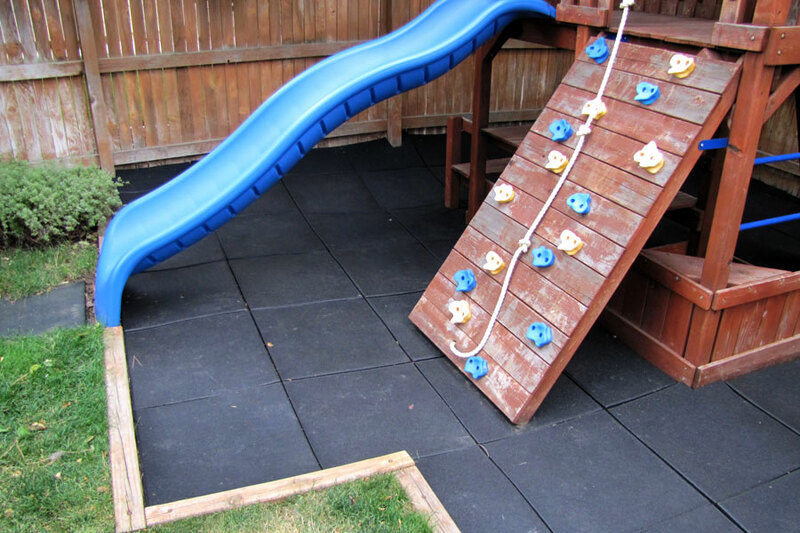 Material – Recycled crumb rubber, colored EPDM virgin rubber flecks, and paint are the primary materials. Standard painted solid colors (blue, gray, terra cotta, and green) can fade in the sunlight overtime like any rubber product however these colors are designed to provide the most attractive and durable outdoor painted tile surface available. The designer series Safe-Play tiles use a ¼” thick top surface of EPDM virgin rubber flecks to ensure the greatest life expectancy available. Size – Tiles are 24” x 24”, Ramps are 8" x 48" for 2.5" thick tile options and 12" x 48" for 3.5" tile options, Inside corners are 12" x 12" and outside corners are 16" x 16" for all thicknesses. Thickness – 2.5” thick (6 foot fall height rating), 3.5” thick (8 foot fall height rating). Weight – 2.5” thick tiles weigh 28 pounds each, and 3.5” thick tiles weigh 33.25 pounds each. 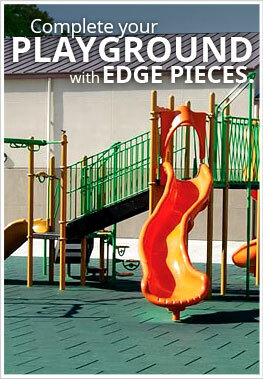 Recommended Uses – Safe play tiles have been used successfully in many different settings: school, park and community playgrounds, skateboard parks, as decks and patios, on rooftops, in daycare centers, outdoor walkways and paths along with other surface areas where a fall absorbing playground or general rubber surface would be beneficial. Sweeping or blowing off the rubber playground tiles to remove any loose crumbs, dirt, dust, sticks, leaves, or other debris from the surface when necessary. If something wet or sticky is spilled on the tile surfaces such as drinks, ice cream, etc, it is best to clean up the area with a water hose or else damp cloth. Occasional damp mopping of the playground rubber tiles with a mild soap and water solution and disinfecting of the tiles with a bleach and water or alcohol and water solution can be useful to help prevent the transmission of colds if kids are sick. A few recommended soaps are Dawn dish detergent or Tide laundry detergent. For 1" thick Safe Play tiles, dowels are used to connect adjacent tiles. We recommend purchasing 6 dowels per tile for a good estimate. If you would like further explanation or help determining exactly what you will need to complete your installation, please call one of our friendly customer service staff members at 866-416-6388. Helps keep kids safe when playing outdoors. Raw materials are safe and lead free. ADA ramps are available for disabled children. Call for pricing. For our east coast customers take a look at our Jamboree Tiles. I'd like to install this on the floor of our garage, underneath some playground equipment to be hung from the rafters. When not in use, however, we'd still like to park the cars in there. Can this flooring handle the weight of a car? Our Safe-Play Tiles can handle the weight of a car. Since these are composed of rubber, oil from your vehicle can break down the flooring over time. Can 2.5" thick Safe Play tiles be installed on level compact dirt. The play area would be surrounded by curbing but not adhered with glue to any under surface. Our Safe-Play tiles are recommended to be installed over Concrete, Asphalt and Wood sub surfaces. Since these tiles are porous, any heavy rain may cause the dirt underneath to become compromised and cause your flooring to buckle. What is the average expected lifespan of these rubber tiles if they are being used outdoors? Our Safe-Play Tiles are made from high-quality rubber and can last for as long as you own the flooring. The warranty on these tiles is five years. My backyard is grass and not concrete. What is the safest way to apply on grass? Our 1" Safe-Play Tiles are installed with dowels. Dowels are little pegs that hold the flooring together. Similar to the pegs used to put furniture together. Our 2.5" and 3.5" tiles are installed with glue. You would place the glue in between the tiles to hold the flooring together. Can you tell me if the tiles are rated to ASTM F3012? If so are they able to protect against impact when the temperatures drop well below freezing? We live in Alaska and the children use to playground until it's -15. Our Safe Play Tiles are not rated ASTM F3012 because they are not loose-fill rubber. These tiles will protect against impact in below freezing temperatures. We bought a house a few years ago that already had a nice playground installed in the backyard. When our child was old enough to use it, we realized that the rubber chips used for the surface were difficult to keep clean with the leaves and pine needles falling on the playground, plus the chips were becoming substandard as the landscape fabric was starting to show below. So we needed to figure out a way to clean the chips, buy more chips, or replace the surface. We decided to replace the chips with rubber tiles and are very happy with that decision. We used the 1" tiles since it was a fairly small playground set and used all black tiles. The area covered was a little over 300 square feet and we used about 84 tiles. Perhaps the hardest part of the project was just removing all the rubber chips and cleaning the site. Installing the tiles with the playground set in place already was simple as the tiles are easy to cut with a utility knife and they are easy to place around existing equipment, measuring with a 2-foot square ruler. It took about 15 hours of work to install all the tiles over the course of two weekends, just doing it by myself. The dowels indeed were a little tricky to get all the tiles to match up well, but the slight grades in the surface also caused this. I think I got a good handle on installing the dowels after doing a few of them. I've only had the tiles installed for about a week, but I can already tell this surface is much easier to clean than the previous rubber chips. The leaves and pine needles blow off easily with my electric sweeper/blower and it's also easy to wash everything off with the hose. Now the "scary" part of the playground in the corner, where it was most dirty and you didn't know what was growing/living back there, isn't scary anymore. The surface is very sturdy and comfortable. I like that it's much more even than the rubber chips and less likely to trip/slip on. Our 2-year old really seems to like it! And I look forward to getting many years of use out of the playground with these new tiles! I bought the Safe-Play Rubber Tiles for an outdoor playground. I wanted to have an easy to maintain and safe area for a new playground in our backyard. The area was landscaped and countersunk 2.5" so the tiles would go flush up against a mow strip. It took about 2 days for 2 of us to lay the tiles out and the hardest part was cutting around the play structure. The end result looks great, we have had rave reviews from all the kids and parents that come over for play dates. This flooring was installed in the outside baby area of our child care center. After we figured out the best way to install it the job went smoothly. We did use a little bit of Vaseline to help the pegs fit into the holes for attaching the tiles together. It all looks very nice and our little ones are very happy to be outside.